A brief chronology of Impington Mill. C17 - C18 There was a Post Mill on the site, referred to in a C18 document. Underneath the existing base is the remains of a roundhouse built from C16 and C17 bricks. This mill would almost certainly have been based upon two crossing trestles forming a square - as, for example, at Bourn. On top of this is a hexagonal structure built from a mixture of the same bricks and later ones, suggesting that the mill may have been rebuilt in the early C17 using three crossing trestles to support the post and hence the body of the mill. 1776 The mill was rebuilt as a hexagonal Smock Mill, using the base of the old Post Mill. c1882 The smock was raised on to a taller brick tower, and the “modern” patent sails fitted. Late C19 An outhouse was added and an external drive for powering by a steam traction engine on calm days was fitted. 1903 John Chivers - local farmer and jam maker - bought the mill. c1910 A fixed gas engine was added. c1920 No longer driven by wind - only by the engine. 1930 Ceased working and the sails were removed. c1938 Ground floor used as an ARP post with a concrete blockhouse inside. 1966 Sold by Chivers into private ownership and “the House, the Mill, the Gates and the Gateposts” were all listed. Concrete blockhouse removed. 1985 Cap and Smock renovated. 2000 New owners, Pippa and Steve Temple, began a major restoration programme. 2007 New sails fitted. Award winner “Historic Building Restoration”, Cambridgeshire. 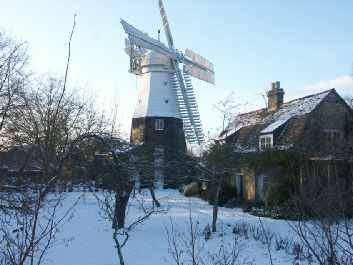 We bought the mill in 1999 with the intent of restoring it and of developing the 1½ acre garden. In 2007 new sails were fitted and in 2009 the restoration of the outside was completed. That year, we also opened the garden under the NGS (the Yellow book) for the first time as well as for Open Gardens. For the future, I want to get the mill grinding corn, and Pippa has further plans for the garden. We enjoy having visitors, so do come and see us!